Howell-Oregon Electric Cooperative offers two types of quality outdoor lighting fixtures which are available for purchase by members. High Pressure Sodium Lights - Utility-grade dusk-to-dawn lamp fixture. The cost of a High-Pressure Sodium Light for HOEC members is $195. For a High-Pressure Sodium Light with New 25' Pole Installation, the cost is $510. AreaMax™ LED Area Lights by Evluma - Utility-grade energy efficient 70W dusk-to-dawn lamp fixture. The cost to HOEC members for the AreaMax™ LED Light (head only) is $360. For the AreaMax™ LED Light with arm, the cost is $395. For the AreaMax™ LED Light with New 25' Pole Installation, the cost is $710. Financing is available for the LED Light; if new pole is needed, pole cost must be paid up front. 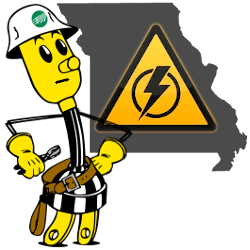 For more information, or to order a LED Area Light or a High-Pressure Sodium Light for your property, contact the Member Services department by phone at (417) 256-2131 or toll-free at 1-888-HOE-POWER (1-888-463-7693).